In tragic news, a Cirque du Soleil performer slipped during a performance of ‘Ka’ at the Cirque’s residency in Las Vegas and fell to her death. The 31 year old Sarah Guyard-Guillot seemed to fall out of her safety harness and plummeted into a pit below. When it became clear that she had sustained serious injuries, the show was stopped, emergency services were called and the audience was ushered away. Dan Mosqueda of Colorado Springs said Ms Guyard-Guillot was being winched up the side of the stage when she seemed to slip from her safety wire and fell screaming. The Paris born acrobat had been with the cast of ‘Ka’ since its inception in 2006 and also ran a teaching program for children called Cirquefit. An online memorial has been set up and tributes have been flooding in, many of them coming from parents whose children had been inspired by her role in their lives. Her death is the first fatality during a live performance in the show's 30-year history. The show has now been cancelled until further notice. 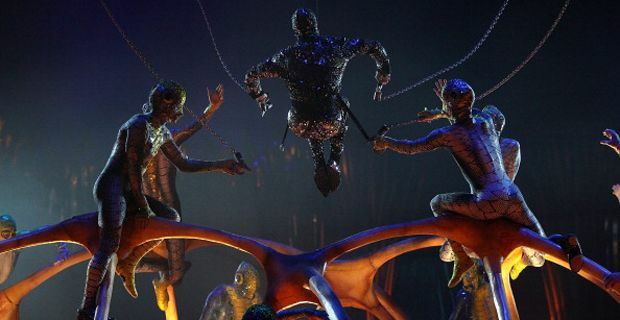 Cirque officials are now co-operating with the authorities investigating the accident. The Clark County Coroner's Office will rule on the cause of death.